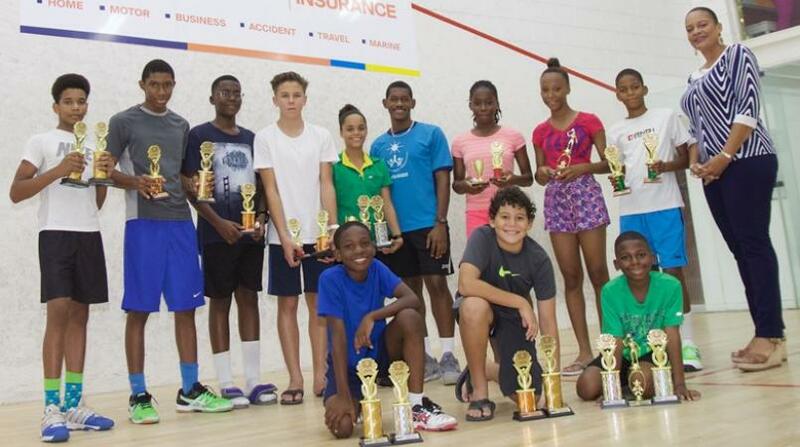 Playing at the Barbados Squash Club, thirteen year-old Cumberbatch was his dominant self, registering victories over Amanda Haywood in the finals of both the Under-17 and Under-19 divisions with scores of 11-5, 11-13, 11-7, 11-6 and 14-12, 11-2, 11-9 respectively. In other divisions, Joshua Seale defeated Darien Benn 11-5, 11-7, 11-7 in a keenly contested Under-15 final, before Benn sealed victory among the Under-13’s with a 11-6, 11-3, 11-5 triumph over Aidan Parris. In the match of the tournament, Alex Stewart then came from a game down to defeat Parris in the Under-11 final finishing with scores of 11-4, 6-11, 7-11, 11-7, 11-9. Third place finishers included Christian Armstrong (Under-19), Seale (Under-17), Chemar Burnham (Under-15), Stewart (Under-13) and Marcus Jordan (Under-9). Haywood and Jada Smith-Padmore, who finished fifth overall in the Under-15 division, received prizes for the ‘Highest Placed Girl’ in their respective age-groups, while Parris and Jodi Smith-Padmore were toasted as the ‘Most Improved Players’. At the prize-giving ceremony, Sharron Alleyne-Elcock, Business Manager with sponsor’s Massy United Insurance, pledged her company’s continued support of local squash. “We are very pleased with the developments surrounding squash, especially at the junior level, and we are happy to announce that Massy United Insurance will continue to further promote and support the young players who are striving for excellence on the squash court. I understand that the level of play during this tournament has been phenomenal and I look forward to even greater achievements by the juniors in the near future,” she said. Many players were using the tournament as final preparation for the Canadian Junior Open in Niagara, Ontario and the US Junior Open at Yale University in New Haven, Connecticut between December 19 and 22.